I am totally and absolutely in love with my latest make! 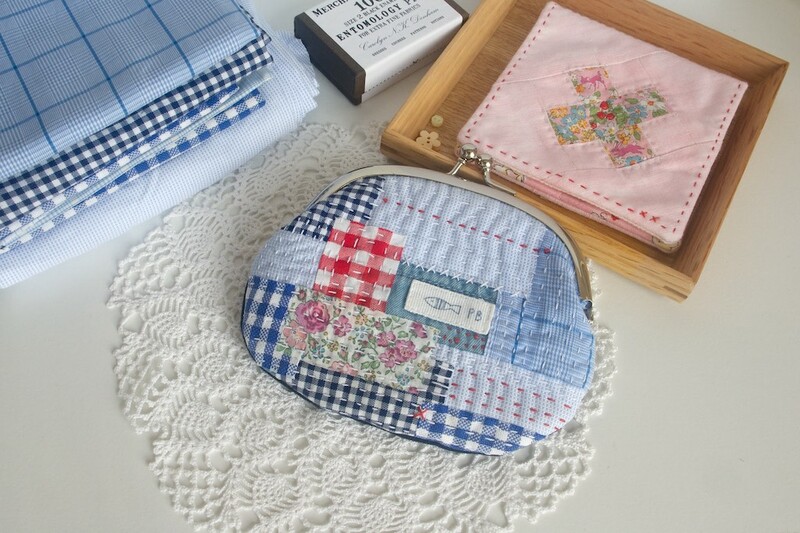 This little boro style kiss lock coin purse was such a pleasure to make, especially the front patchy part. I have always admired this kind of patched up tattered look, but never had enough courage to give it a go until I found a perfect pattern. 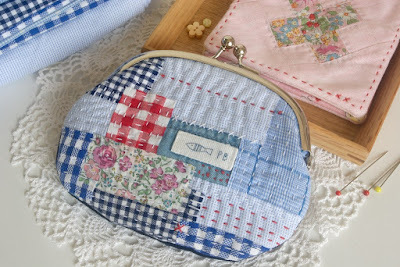 This little purse is a very special make, just like most of the things that I sew. The fabric and the idea have to evoke some special memories so I can make an emotional connection with the item I am working on before I can truly express what I "see and feel" in my heart and make all the bits and pieces come together. My little makes have to tell a story. Well, this purse is exactly that. 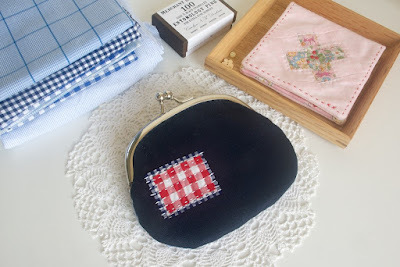 I was going to use the navy linen only, but as I was pulling the pieces of fabric one after another and matching them this way and that way, this little story formed in my head and the project became alive. It became my very own and very personal. It represents our little family and let me tell you how. The tiny fish in the middle is a piece of a pocket from a small pair of our Little One's jeans. Our Little Boy came into our life almost three years ago and changed it so much in every possible way, and he truly became the centre of our attention. Full of fun and joy, constant questions and endless curiosity, full of warm hugs and sweet kisses. The red piece comes from an old shirt of our so Big Now first baby boy and it represents him and the way he changed our family when we became parents and our family grew from two to three. He was the only one for twelve years and was surrounded by our love and constant attention. This piece stands out as a bright red spot and reminds me of the times when our so Big Now Boy was still So Little and was all into the solar system and learnt everything he possibly could about all the stars, planets and that giant red spot on Jupiter. The small floral piece is me - the only girl in our family. I love girly things, I love flowers and fabric, so it was just logical to use this pretty piece. The piece came all the way from Japan as a tiny bonus with one of my fabric orders and it also represents all the love and kindness from complete strangers that came into my life when I started my sewing journey. 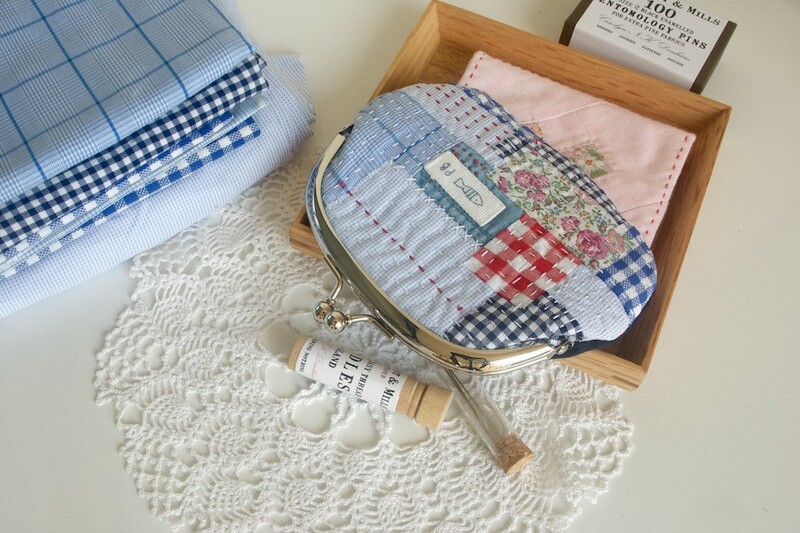 The biggest part of the pouch is covered with blue check fabric pieces that come from my dear husband's old shirts and represents him. His love, support and care he gives us day after day, year after year. Strong and calm, funny and gentle, he is always here for us. All the stitches in white and red represent the bond between all of us and all the hugs and kisses and days we spend together doing things together, looking after each other, helping and sharing things we love doing. I am so glad that I was able to give a new life to these old pieces of clothing, that I made something special that is going to make me smile and warm up my heart every time I use it. I don't think I will be able to put it my handbag (it is too precious for that), but it would be just perfect for storing some of my sewing notions and use it while I work on my projects so my little family can be with me all the time. This lovely Boro Style Purse is designed by Jane McDonald and it is available on the Cosy Project website. Make sure to read to the very end to find a Little Surprise for you that you might enjoy. OK, let's talk about the pattern a bit. It was fun to make pretty much from the beginning to the end. I especially loved working on the patchy panel. The pattern does not tell you how to arrange the pieces and what and where stitches to use. It's all left to your imagination and this is exactly what I love about this pattern. Because it let's you make this purse your very own and unique. If you do not have a particular material that this patten calls for, do not get alarmed. Just substitute. This pattern calls for a piece of a quilter's muslin. I have never seen or used it, but I simply used a piece of a light weight linen instead and it worked perfectly. 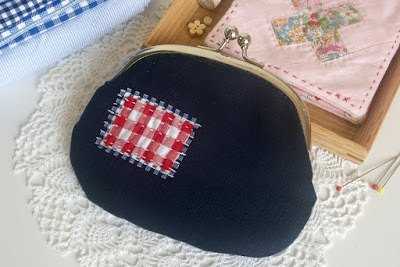 I found the stitching part very easy and enjoyable, much easier than quilting because you stitch through a few thin layers only and there are no any seams. I was going to use a square kiss lock, the one with the holes for stitching that I am used to, but I found in my stash the rounded one. Well, I have to tell you the truth - this part was finicky and it got a bit messy. I even regretted that I decided to use this frame that requires the use of glue, but I am glad that I tried this new frame. Once I worked out the right amount of glue needed (too much glue makes the work messy and difficult to stick everything together), things went fine. So make sure to apply just a little bit of glue at a time and patiently follow the instructions. OK, now comes the little surprise part. Cosy Project has kindly offered a 20% discount on any patterns and online classes on their website when you use the code "stitchingnotes" at the checkout. How fun is that! The offer ends on the 31st of March so do hurry up! Thank you very much! 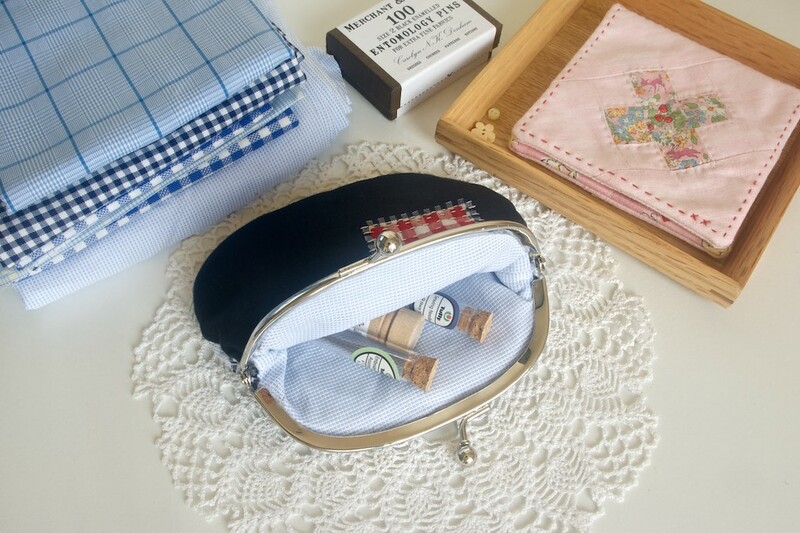 Purse sewing can be quite intimidating, but once you try it becomes much easier. Happy sewing! 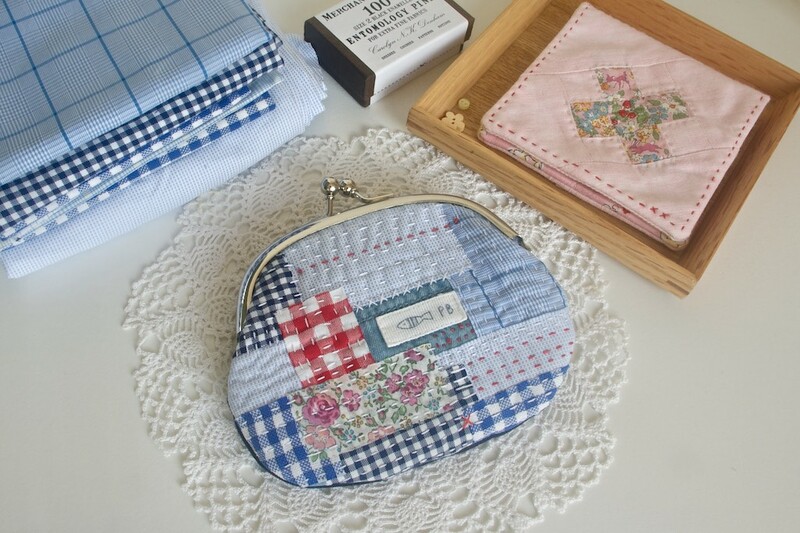 The story of yuor lovely purse is so affecting - thank you for sharing it, Larisa. 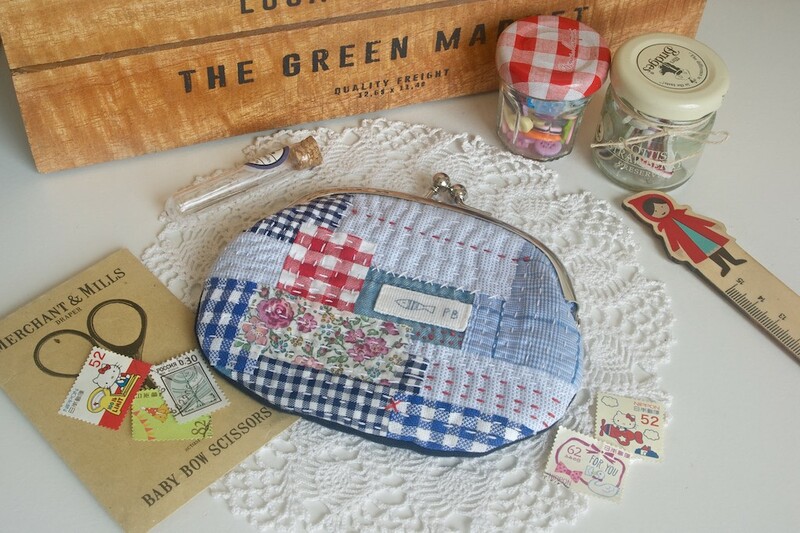 This is such a sweet coin purse. I love it and the story that made this little purse have a life. What a beautiful little heirloom this piece will be. Thank you, Kathleen so much for you lovely comment! Sometimes I put so much of my heart into making something simple that I cannot bring myself to use it in fear of ruining it. :-) So I hid this little purse away.